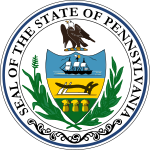 The Pennsylvania gubernatorial election of 1796 occurred on November 8, 1796. Incumbent Democratic-Republican governor Thomas Mifflin successfully sought re-election to a third term. For the second consecutive election, he was victorious over U.S. Representative Frederick Muhlenberg, the Federalist candidate, by a wide margin. ^ "Pennsylvania Gubernatorial Election Returns 1796". House of Representatives of the Commonwealth of Pennsylvania. Retrieved 3 July 2012.